The most popular and signature item from Decowall, DW-1307:Planets in the Space Wall Stickers is now being upgraded to a new version! Enhanced design as well as its individual space planet size and its details are more precise than ever! Can be used for both decorative and educational purpose. It is such a great gift for your kids and will transform kids rooms into a outer space! 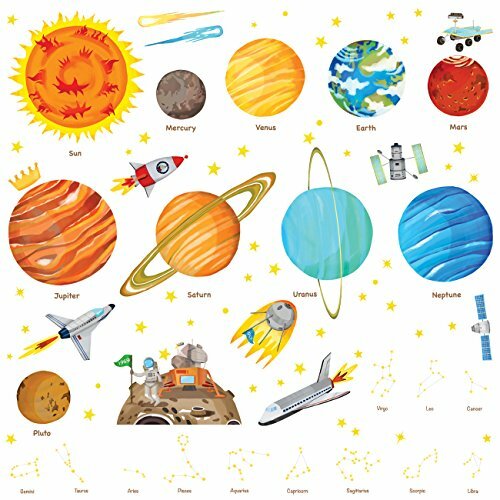 Specific details like zodiac signs, Space ships, Satellites and Brief history about space and planets are great resource for kids, exploring astronomy and other space related topics. Learning about science should never be boring! If you have any questions about this product by Decowall, contact us by completing and submitting the form below. If you are looking for a specif part number, please include it with your message. Shiba Inu Dog Plush Pillow, Cute Corgi Akita Stuffed Animals Doll Toy Gifts for Valentine's Gift, Christmas,Sofa Chair, brown round eye, 15"
SQUISHMALLOW Puff The Penguin Pillow Stuffed Animal, Blue, 16"
KC CUBS Kev & Cooper Playtime Collection ABC, Numbers and Shapes Educational Area Rug - 5'0" x 6'6"